Everything is growing like crazy at my place, including weeds in my garden paths. Unfortunately, I don’t have white clover growing there like I usually do. Dutch white clover is a short-lived perennial that, in my opinion, is great to have growing in your garden paths. Without white clover, I mulch my paths with leaves or grass clippings, with or without newspapers or cardboard underneath the mulch. Although I have access to leaves and grass clippings from our own property, sometimes they are used to mulch the crops in the garden beds or other areas in our landscape, leaving little for the paths. 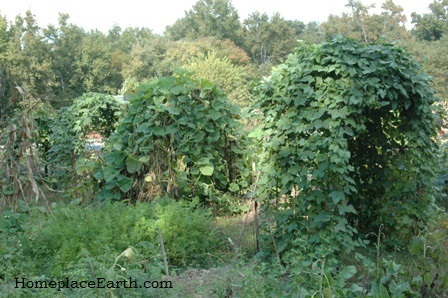 I used to have access to as many leaves as I could want that came from other places and I used them liberally in my paths and on my beds. Now, however, there is a danger of herbicides being used that persist in the environment for a long time after they are used and could be in materials I would acquire. I wrote about that in my post on Killer Compost. When I decided to limit outside inputs to my garden, including those leaves that were hauled in from elsewhere, I had to rethink what I would do with the paths. I turned to Dutch white clover and have been pleased with it. I am thinking even more fondly of it now that it is not here. 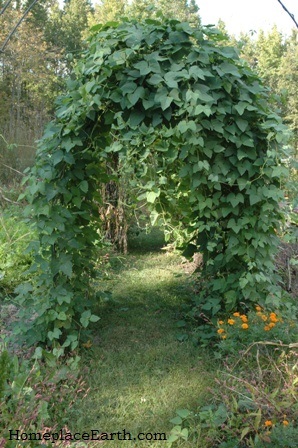 Winter squash provides mulch for this path. So, why is white clover not in my paths this year? 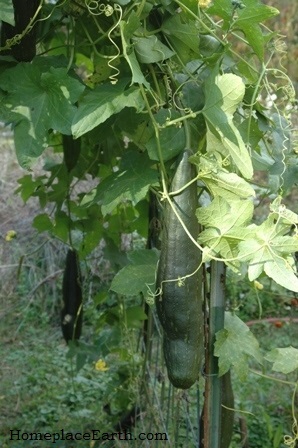 Last fall my attention was called to too many things besides the garden. I was happy I was able to get the cover crops planted in a timely manner, but I never tended to the paths. I told myself I would do that early in the spring. Unfortunately, spring proved to be busy, also, and the clover never got planted. Well, I’m paying the price for that now. I have been weeding all my paths and mulching with grass clippings from our lawn. I’m also taking advantage of things like letting the winter squash wander into the path, naturally providing mulch, as it is doing in this photo beside this cowpea bed. 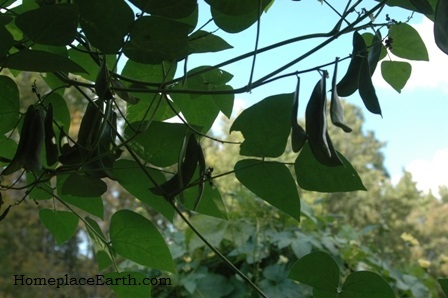 The cowpeas will need little tending until they are harvested for dried beans. Ordinarily, in the fall when I plant cover crops I reshape my beds if needed, scraping any loose soil from the paths back into the beds, and sow white clover in the paths—raking it in with my cultivator. It gets off to a good start in the fall and keeps a green cover on the paths through the winter. In the spring it is growing nicely and keeping the weeds away, allowing me to concentrate on what to do with the garden beds, with little maintenance needed for the paths. Dutch white clover is the lowest growing clover, so that is the variety you want. 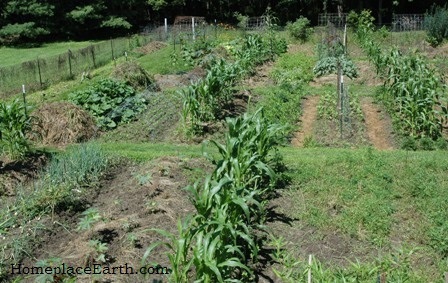 You can see my garden with clover paths in my DVD Cover Crops and Compost Crops IN Your Garden. The clover will flower here in June. Too often I wait until it is in full flower to cut it, which is probably why it sometimes dies out in mid-summer and needs to be planted again in the fall. That’s okay. It had done its job for the year. If I trimmed it sooner, it would probably last longer, just as it keeps growing in your yard when you mow it. I only cut it a couple times during the summer with my sickle—the same one I use to cut my grains. Those of you who are into noisy machines might use a string trimmer to keep the clover trimmed. Sometimes the clover creeps up into the edges of the beds, but I don’t find that to be a problem. The clover keeps weeds from the bed edges and can be easily pulled out when I weed the beds if it starts to creep in too far. 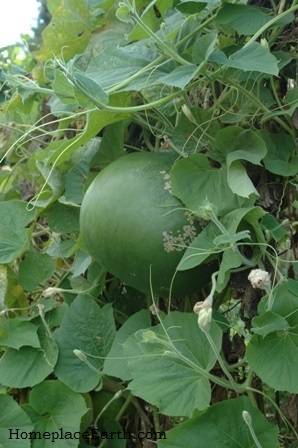 In that case I harvest it for compost material. Some paths did get attention in the spring and they have cardboard or brown paper bags as mulch, sometimes under grass clippings and sometimes alone. The organic grain I buy to grind as feed for my chickens comes in the brown bags. I don’t have many chickens, so not so many bags, but I save them up for this job. I don’t go looking for cardboard for the paths, but sometimes boxes find their way to my house and have no other use. I have not made a study of whether cardboard is safe to use in your garden these days, but I don’t use it often—only when the boxes start to accumulate and I need to cover garden paths. Remember, most years I have white clover growing there, so don’t need the mulch. We get the newspaper daily and usually recycle it, but when I need to keep the weeds under control, such as now, I use it (newsprint only, not the glossy sections) in the paths. Since newspapers tend to blow around, I cover them with grass clippings. Rye straw from the mulch in the bed on the left of the corn and grass clippings in the path on the right. 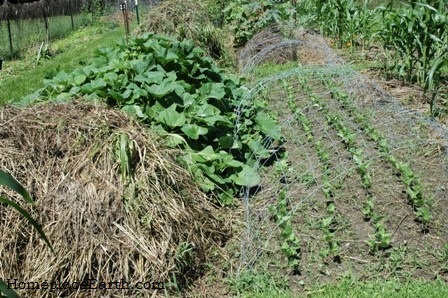 I grow grains in my garden and if I didn’t use the straw for the carbon addition to my compost, it would be available to use as mulch. In some of my beds rye is grown to be cut early and kept on the bed as mulch for the next crop. Allowing some of that rye straw to spill into the paths takes care of some of them. 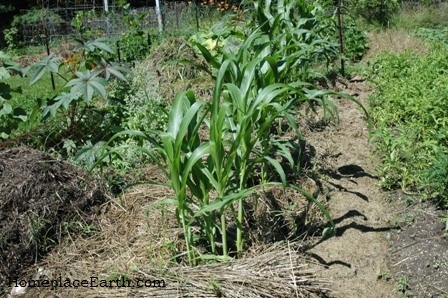 In this photo you can see the rye straw from the bed covering the path on one side of the corn bed and grass clippings mulching the path to the right of the corn. My paths are now all weeded and mostly mulched (more grass clippings coming with the next mowing), so they should be good for the summer. I have to admit, they started to get away from me there. I always like to have everything under control by July 4th. If your garden is getting the better of you right now, don’t beat yourself up. Harvest the weeds to feed to your compost pile and be happy for the great compost they will make for your garden for next year. Then, make a plan so you will be more in control in the future. You can bet that I’ll be planting Dutch white clover in the paths this fall, making my work easier in 2016.